When WWI started, the size of the German army and its strategy of marching through Belgium instead of a direct offensive against France took the French and the British by surprise. The German army had nearly reached Paris when a counter-attack caught it over-extended and it was forced to retreat. After a month and a half of desperate fighting, the Allies and the Germans built lines of fortifications that stretched across Europe from Switzerland to the Belgian coast. These lines would change little during the next four years. Once the war entered a static phase, the planes’ primary role was to observe the enemy’s fortifications and rear areas to determine when a major push would occur and to serve as spotters for artillery. Bombs could be dropped from planes but the fragile aircraft could not carry the powerful bombs needed to cause serious damage. Planes on both sides had been unarmed at the start of the war, but guns were soon mounted on the planes, as each side tried to maintain control of its own airspace to deny the enemy information about its defenses and planned offensives. The faster models became pursuit (fighter) planes, which either hunted enemy observation planes or protected their own observation planes. Dutch designer Anthony Fokker had built a plane with a timing mechanism to synchronize machine gun fire with the engine, so pilots could shoot without hitting their propellers. The new planes were embraced by more aggressive German pilots, including Oswald Boelcke and Max Immelmann, in July 1915, and they soon took a toll on the slower, lightly armed British planes. Feeling defenceless against the much superior German planes, British pilots began to call themselves ‘Fokker fodder.’ Both pilots and planes were hard to replace but Brigadier-General Hugh Trenchard, commander of the Royal Flying Corps (RFC), was aware of the huge sacrifices being made by the army, so he ordered his pilots to continue with reconnaissance missions. Hoping to lessen the risk, he had the pilots fly in groups, which made it harder for lone Fokkers to approach, although it also reduced the number of missions that could be carried out. The recently developed Vickers Gunbus (biplanes with a Lewis machine gun mounted in the observer’s front nacelle and the engine in the rear) squadron was assigned to protect the bombers in July 1915, but the survival of a majority of British pilots was mainly due to the small number of the Fokkers. Even so, the squadrons had taken terrible losses by the end of 1915. Major Brand (Rathbone), the commanding officer of an RFC squadron in France in 1915, thinks that his pilots are being sacrificed unnecessarily by the staff at Head Quarters (HQ), who are safe in the rear. Replacement pilots have received so little training that they are rarely able to survive their first encounter with the enemy, therefore the squadron is never able to rebuild. Lacking the right temperament for the position, Brand is gradually losing his nerves. The pilots relieve the ever-present tension through drunken revelry every night but Brand spends his free time brooding in his office. 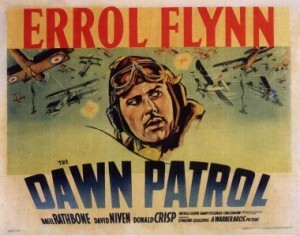 In particular, Brand believes that Lieutenant Scott (Niven) and Captain Courtney (Flynn), the squadron’s top pilots, hold him responsible for the deaths of so many pilots. When German ace Von Richtor buzzes the airfield and drops a pair of trench boots with a note saying that the British pilots belong in the trenches, Courtney and Scott disobey orders and bomb Von Richtor’s field. 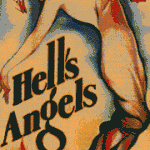 They are about to be court-martialed but the successful destruction of the enemy aerodrome wins Brand promotion out of the squadron, and he gleefully appoints Courtney as his successor to show how much fun it is to send inexperienced young men off to die. The job quickly drives Courtney crazy as he argues futilely with HQ that his raw pilots are not ready to face Von Richtor’s squadron. Worn down by the impossible situation, a painfully lonely Courtney hides in his office and has to force himself to go outside to give orders. One of the new replacements is Scott’s younger brother, who was supposed to be in school, but had joined up because he did not want to miss the fighting. When Scott’s brother is shot down on his first patrol, Scott accuses Courtney of killing his brother. Racked by guilt, Courtney seizes the only opportunity to leave the squadron. The planes flown by the British are mainly French Nieuport 28s, which had been introduced in March 1918. The French air force had already adapted the SPAD S. XIII by this time, but the United States Army Air Service had expanded much too fast for American air plane manufacturers to keep pace, so roughly 300 Nieuports were purchased and issued to the first few American fighter squadrons until France was able to produce sufficient SPADs to equip the American squadrons. As more recent planes, the producers probably felt that the Nieuports were easier to find, even though British fighters did not have twin synchronized machine guns in 1915. While the decision to use more commonly available planes undoubtedly resulted in exciting aerial scenes, it gave a false view of the historical situation. The RFC suffered heavy losses during the second half of 1915 because the Fokkers considerably out-performed British planes. Once British pilots received planes that were the equal or superior to the Fokkers, the tables were turned and the German pilots found themselves on the defensive. However, the cause for the high mortality rate among replacement pilots is inexperience, not inferior planes, in the movie. It may seem callous that a captured German pilot is invited to spend the evening drinking with the pilots, even though he had killed a member of the squadron, but this often happened. Also, the incomplete communication system at the front meant that pilots would sometimes be raising a toast to a dead pilot when he would suddenly walk in. Enemy pilots would often drop a downed flier’s personal belongings at his airfield to let the members of his squadron know what had happened to him. While these actions helped reinforce the image of chivalrous knights jousting in the air, any hint of nobility disappeared once the shooting started. Pilots learned to attack from behind, give no warning and show no mercy if they wanted to survive. Although Max Immelmann became the first German air ace, it was Oswald Boelcke who introduced the four basic principles of air combat: secure height advantage; attack with the sun behind you; hide in clouds; and attack at close range. British ace Edward Mannock established similar rules for the RFC in 1917, emphasizing attacking from above and waiting until you were as close to the enemy as possible. Refusing to simply copy Fokker’s interrupter mechanism, British designers experimented with a number of different locations for the guns, such as the wings and the top-plane. The first British plane able to match the Fokker was the Airco DeHavilland 2 (DH2), which appeared in February 1916, and did not need an interrupter since it was a pusher (the engine was located in the rear of the plane). In fact, the roles were soon reversed and German pilots in Fokkers would retreat as soon as they saw a DH2. While the technological disadvantage had disappeared, the pressing need to fill the rapidly expanding squadrons meant that replacement pilots were arriving with less than twenty hours of flying time. Fortunately for the over-strained RFC, the majority of the Fokkers were assigned to Verdun to support the German offensive against the French. The first tractor plane (where the engine was located in the front) with an interrupter was the Sopwith two-seater, which appeared in May 1916. The script captures perfectly the mood in the squadrons but contains almost no actual details about the war. Replacements appear every night, singing and bursting with youthful optimism, because Trenchard had adopted a policy of ‘No empty chairs at breakfast.’ Believing that empty chairs would remind the pilots of fallen friends, replacement pilots would be sent during the evening to any squadron that had lost pilots that day, so that all of the chairs at the breakfast table would be full the next day. It is true that replacement pilots were rushed through flying school and sent to the front dangerously unprepared but there is no reference to Trenchard’s emphasis on offense or the expansion of the RFC to match the rapid growth of the British army. In fact, the film fails to mention Trenchard, any famous pilots, either British or German, the situation on the front, the Allied or enemy supreme commanders, or even the types of planes that they flew and the new models that they should have been eagerly awaiting. The dialogue is basically copied verbatim from the script of the 1930 original. One of the few changes to the script is the new version’s anti-war ending, which criticizes the waste of so many men. 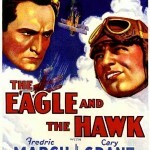 Aside from a few scenes with closeups of the cast of the 1938 version, most of the action sequences, including strafing and bombing of ground targets, and aerial footage were taken from the 1930 film. Despite the jarring transition in film speeds from the ground scenes to the aerial scenes, the remake is superior because of the vitality and charisma of the actors compared with the stiff acting in the 1930 version, where the actors were still unnacustomed to sound. While it is physically impossible for Errol Flynn to not radiate jolly charm, the WWI story is much grimmer than his usual swashbucklers, so the movie has some of Flynn’s best acting. Having literally crossed swords in Captain Blood (1935) and The Adventures of Robin Hood (1938), the confrontations between Flynn and Rathbone have a natural antagonism. Brand’s near-manic laughter when he learns that he can appoint his successor is disturbing, and shows that his grip on sanity had been slipping. Later in the movie, Brand pops by for a visit, and the contrast between the buoyant Brand and Courtney’s brittle tension highlights the burden of command. 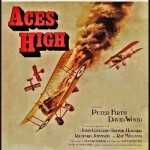 Excellent aerial scenes, a sharp script and some of Errol Flynn’s best acting make it a superb introduction to the war in the air during WWI.